There's something magical about stepping into the woods. 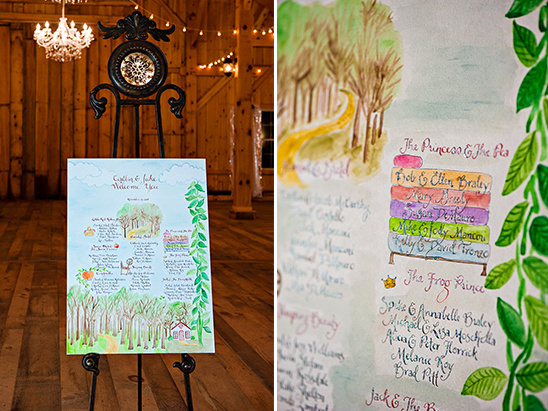 Perhaps this is why so many fairy tales are set in the forest and why the forest is the perfect setting for a fairy tale wedding. 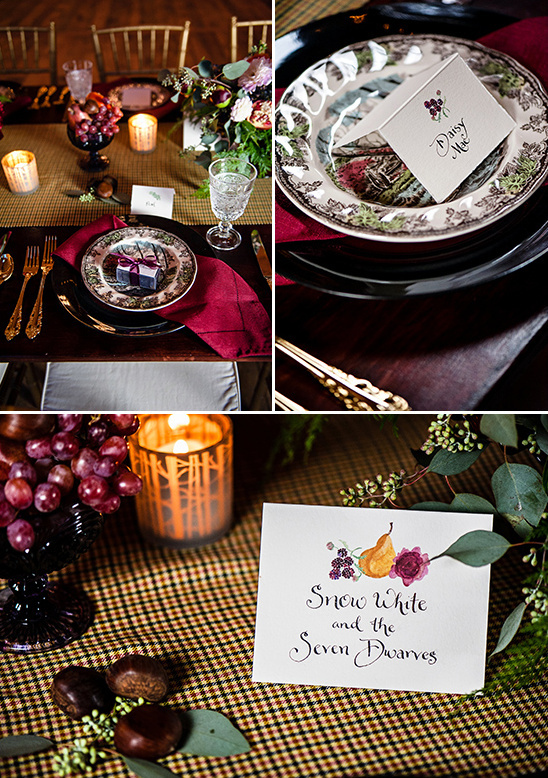 This styled shoot is inspired by the enchanted woods and the fairy tales that take place there. 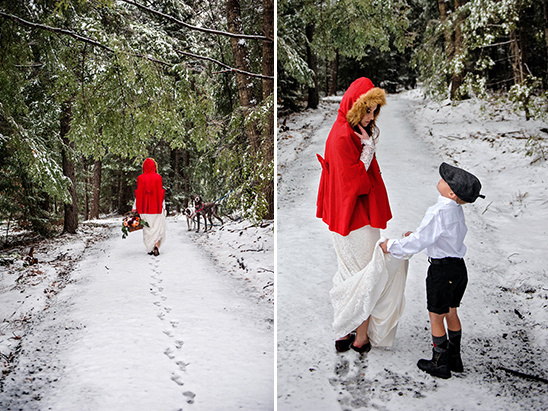 Make sure to keep reading for a delightful little story tailored to go along with this shoot. 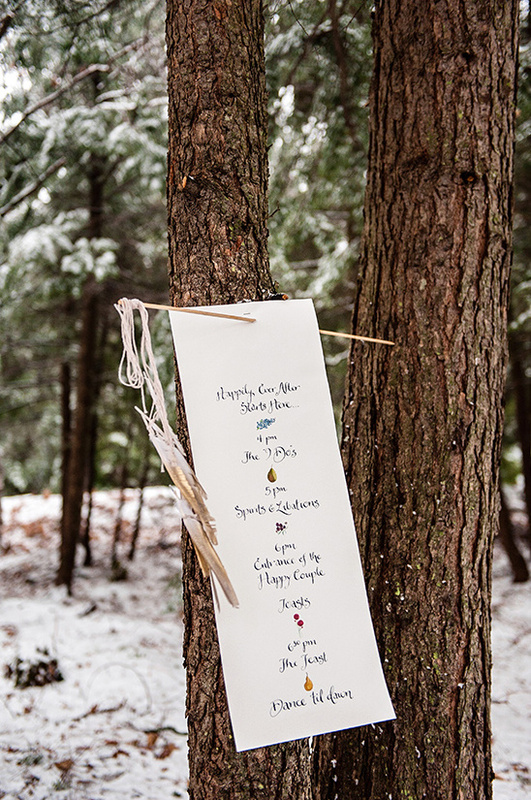 Embrace the whimsy of these magic in the woods wedding ideas and view the full gallery here, photographed by Melissa Mullen Photography and styled by Daisies and Pearls | Merryaking. Our story begins when a little boy named Hansel and his sister Gretel lose their way on a walk through the thick forest. They come upon a beautiful young woman wearing a red riding hood as she frolics with her seven (dwarfs) dogs. Meeting up with the children the woman invites them back to her cottage to join in a jubilant celebration. You see, today the woman, a teacher, will marry her Prince Charming, a children's author. 1. You will not have to worry about frizzy hair or your makeup melting off your face due to the hot summer sun. 2. You can get one of those stylish faux fur shrugs you have been eying. 3. 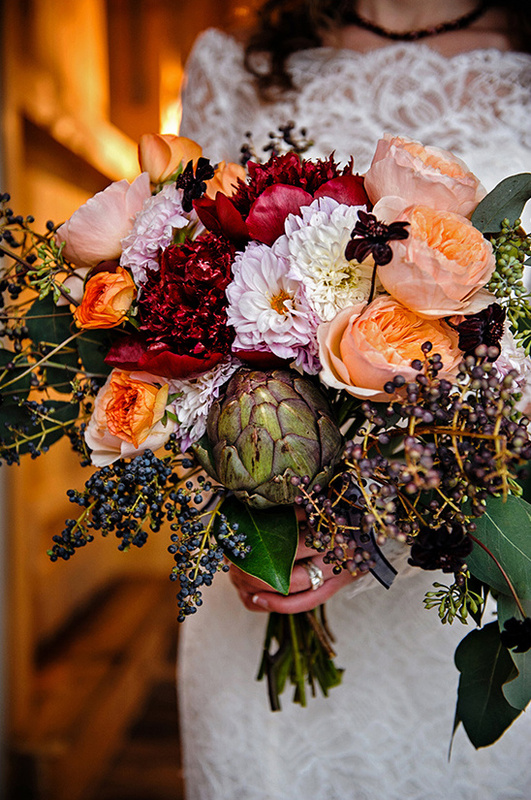 Winter bouquets can be ultra gorgeous. Think pine-cones, holly, and evergreen, anemones, ranunculuses. The options are endless. 4. There are plenty of cranberry inspired cocktails to select from. 5. Hate your your arms? Not a problem you can wear an utterly elegant long sleeve wedding gown to cover them up. 6. Save Money! 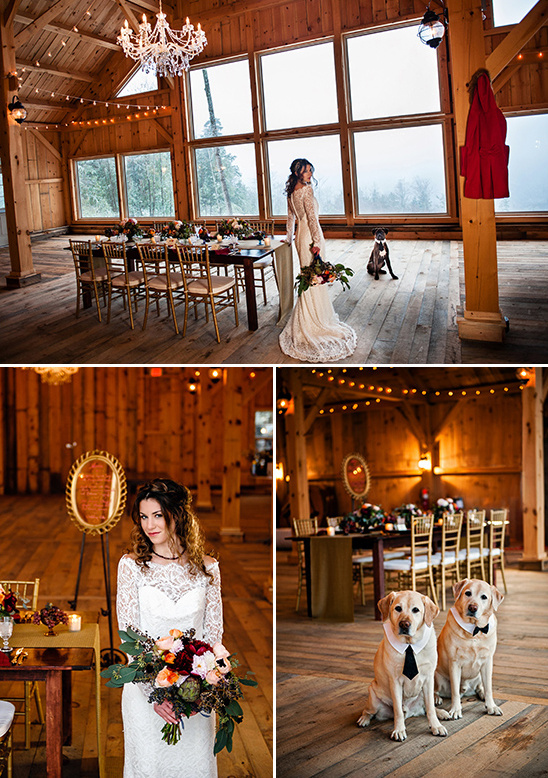 Venues are typically less expensive in the winter months than in peak wedding season. 7. Everyone will be there! Summertime is usually very busy time - vacations, camps and lots of weddings. Stand out, and plan a wintery white dream that even your jet-setting friends can attend. 8. Really, who doesn't look good in jewel tones? Dress your bridesmaids in crimson, eggplant or forest green floor length gowns. Stain their lips with a berry hue, and you have one good looking set of ladies. 9. It is always summer on the other side of the world. After your snowy nuptials travel somewhere exotic for your hot and steamy honeymoon. 10. Have a pie table that is only acceptable during the colder months. Guests can enjoy Caramel Apple Pie, Pumpkin Chiffon Pie, Maple Pumpkin Pie with Salted Pecan Brittle and of course you must have a Spiced Cherry Pie. Yum! The Bride's pups keep the children company as the Bride freshens up before the ceremony. 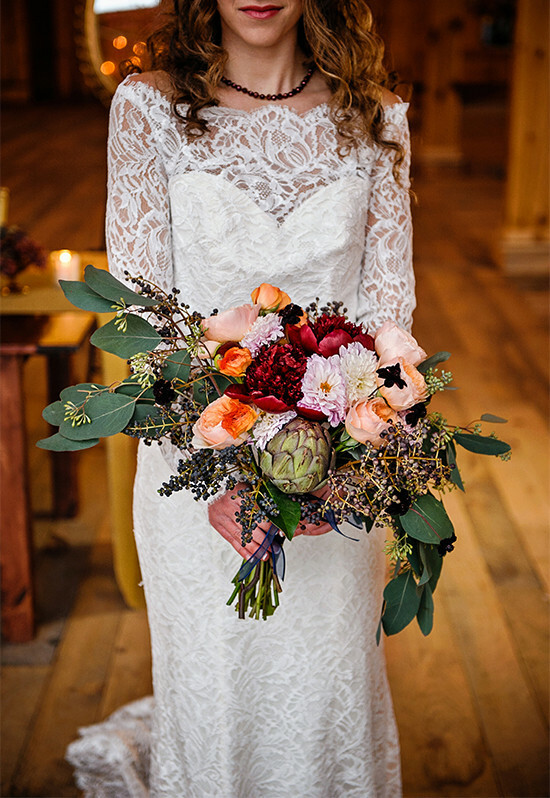 She returns in a stunning lace gown complimented by a floral bouquet of dark blooms. Her Prince Charming appears (hops) into sight and the two exchange bands of silver. Following the ceremony, guests find their seats at fairy tale themed tables. The wedding party is fittingly seated at the "Snow White and the Seven Dwarfs" table. 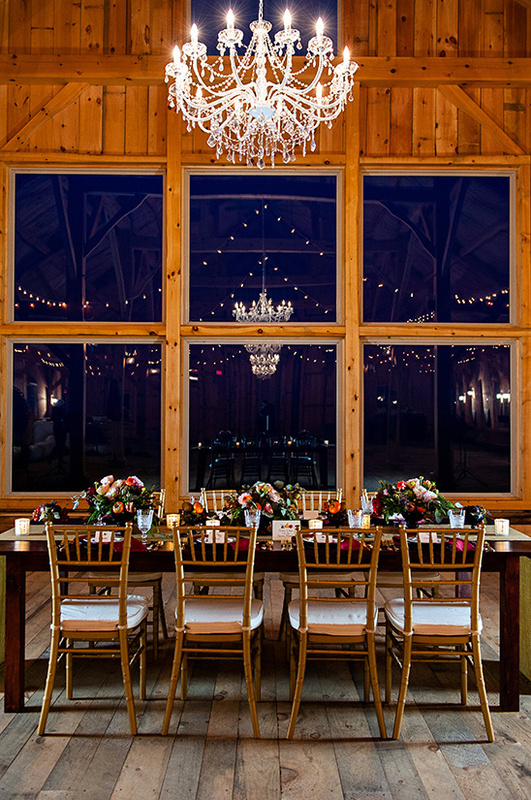 Each dark wood farm table is adorned in a rich autumn color palette. 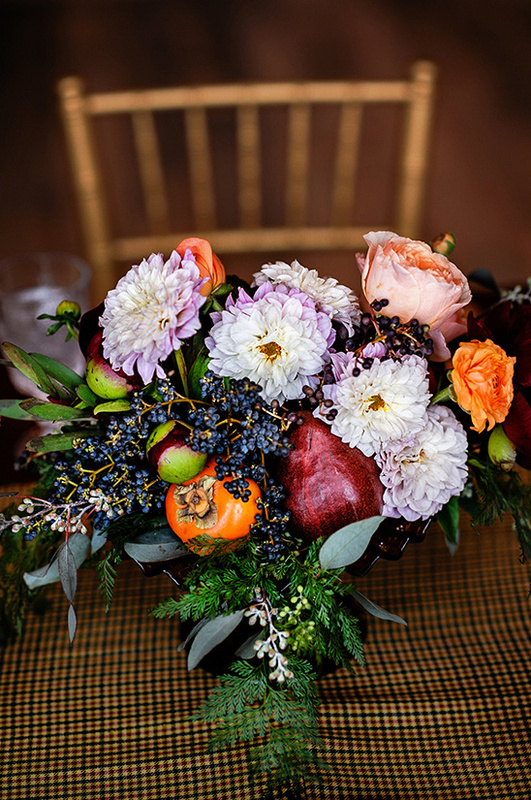 A check runner anchors three compote floral and fruit centerpieces. 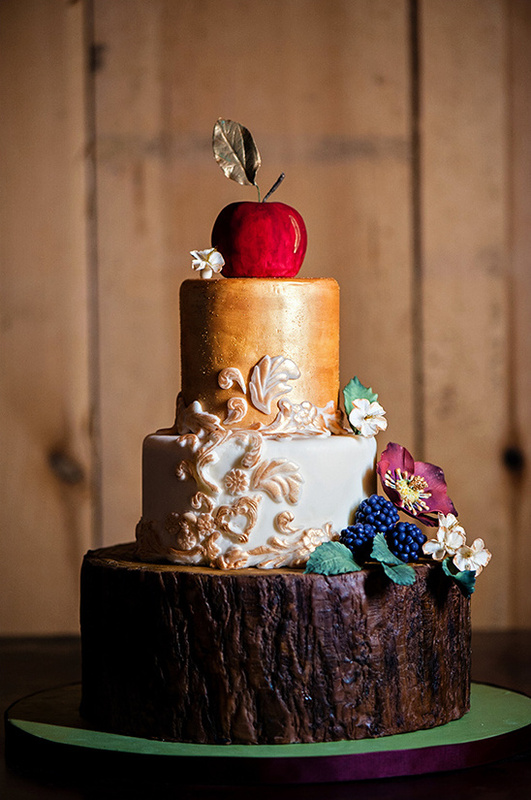 After the grand feast guests are treated to scrumptious cake almost too pretty to cut. The cherry on top of the lovely evening are delectable chocolates for guests to enjoy upon their safe return home through the woods. Because guests grew weary early in the evening from a joyous jamboree, they missed the most magical moment of the event. At the stroke of midnight the Bride kissed her Groom the frog and he ribbitted one last time before transforming into a handsome man. The couple lived happily ever after...The End.